Wow. I have returned from Comicon! As expected, it was an adventure full of debauchery and sensory overload. However, I’m really exhausted now…and it will take me a few days to get my footing. Ill try my best to get some posts up by Thursday. 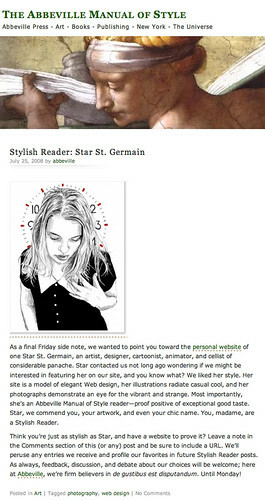 In the meantime, thanks to Laughingsquid, and The Abbeville Manual of Style for writing about me! ahhhh tori amos!!!!! she is so unbelievably hot and cool. and creative. and well, amazing. laughing squid is lovely too. they are hosting my new website, yay! 🙂 can’t wait to get it set up. it’s a lot of work! love your blog! just wanted to quit lurking and say hello. Way to go, girl. Congratulations on your book and all the press you have and will acquire for your hard work. Yay Comicon. Wish I could have gone. Have put in a birthday order for YOUR book. And, holy cow Tori’s hair is just amazing. So vibrant. Thanks guys! I’m incredibly lucky to be involved with so much awesome.